Kahlil Gibran is an accomplished artist, a writer, and most of all, the third best selling poet of all time, falling behind Shakespeare and Laozi. 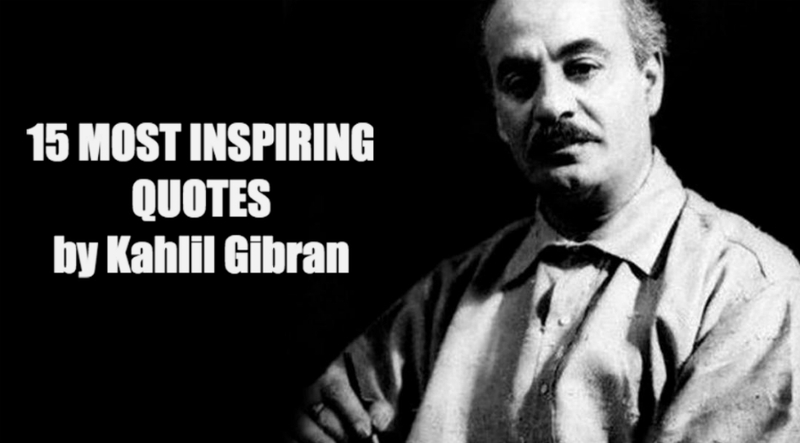 Though Gibran has written 19 books and 16 poem collections, his book The Prophet is the most famous of all. It has been translated into more than 40 languages and never run out of print even unto this day. The following quotes are some of the most inspiring from his work. They speak directly to your soul. There’s something unexplainably powerful when you read quotes like these. They penetrate through all the layers of our ego and ignite what we really stand for. 1. Speak your mind out to calm your inner argue. 2. The one destined to love you will never leave your side. 3. Do not lose your individuality when you love someone. 4. Suffering brings out the best in your character. 5. You weep for the ones that you care about. 6. True beauty lies within the heart. 7. You don’t need to be always understood. 8. Connecting with nature brings you delight. 9. It’s only when you’re tender and kind that you’re truly strong. 10. We need one another. 11. Only little minds belittle others. 12. Your life is defined by your attitude towards it. 13. The beauty we see outside is actually inside us. 14. Your days are worth more than gold. 15. You can only find real joy when you serve others.